On Sale Now! Free Shipping Included! 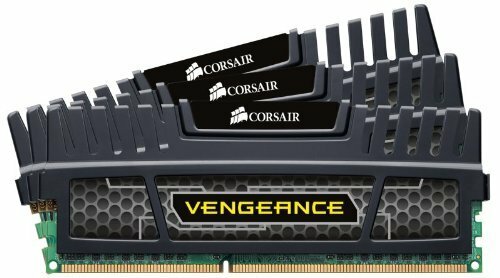 Save 10% on the Corsair Vengeance 12GB (3x4GB) DDR3 1600 MHz (PC3 12800) Desktop Memory 1.5V by Corsair at Pacs BG. MPN: CMZ12GX3M3A1600C9. Hurry! Limited time offer. Offer valid only while supplies last. CORSAIR high performance Vengeance memory module 12GB ( 3 x 4GB ) 1600MHz 9-9-9-24, CL9, 1.5V for motherboards using Intel triple channel processors. CORSAIR high performance Vengeance memory module 12GB ( 3 x 4GB ) 1600MHz 9-9-9-24, CL9, 1.5V for motherboards using Intel triple channel processors. Vengeance memory modules provide users with outstanding memory performance and stability. Each module is built using carefully selected DRAM to allow excellent overclocking performance, and has a lifetime warranty.